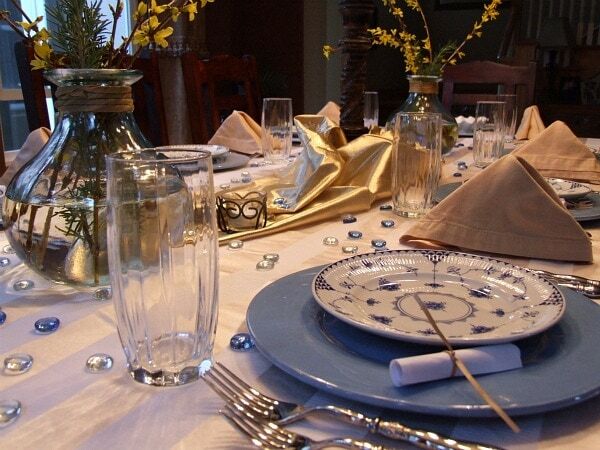 For a Greek theme, try to stick with gold & blue… the typical colors associated with Greece. Greek wine was tough to find in our big city, but a few of our guests managed to find it. Instead, we included a Greek cocktail. Use all or some of the recipes below to create a Greek-themed dinner party. Double or triple the recipes to reach the desired serving sizes. Give recipe links to your dinner party participants so that they can contribute to dinner, or prepare all on your own. I tend to over-plan and have included lots of recipes for this party. Pick and choose which ones you like best, or use them all! Our Gourmet Group voted this one as the best in terms of how delicious all of the food was. You can read more about my Greek Dinner Party (and see photos) in these blog posts: part 1 – part 2 & part 3, but for recipes with photos, click on titles below to print. Click here for a printable .pdf copy of the Greek Dinner Party menu. For a fun little table-talk activity, I researched Greek Gods & Goddesses. I did a little write up on each one and rolled them up in a little scroll to put at each place setting. When my guests sat down for salads, everyone was asked to open their scroll and they took turns reading about their designated God or Goddess. It was quite fun, as the scrolls are written in the first person and most of the gods have some pretty bizarre stories associated with them. There activity provided for lots of laughter, and it was a great way to begin the dinner. If you’re interested in doing this same activity at your Greek Dinner Party, click here for a printable pdf copy of the greek god information & pictures. Simply cut them out, roll them up and tie with a little ribbon (blue for gods & pink for goddesses). My husband and I are also in a gourmet dinner club. We call ourselves the “Cooking Together Couples” as the spouses have to participate. The host decides on the Theme, and prepares the Main Course. 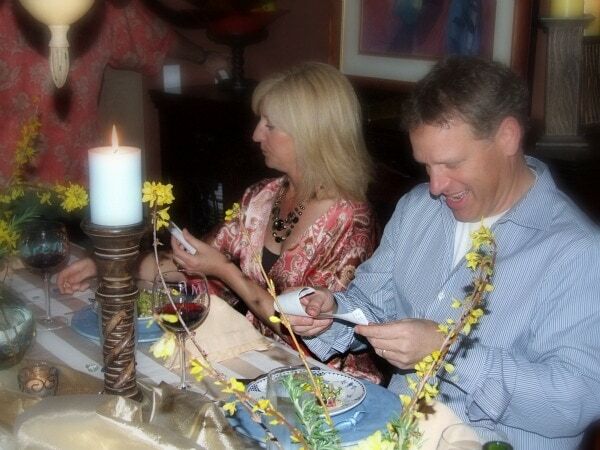 While the other 3 couples, prepare the Appetizer, the Starter, and last but not least Dessert. All paired with a drink or wine accompaniment. Our theme this month is Greek, and we are on for the appetizers. I was looking for a drink pairing. And came across your blog. I plan on making your Greek Mojito to pair with the 3 dips I am making: Tyrokavteri, Black Bean Hummus & Tzatziki, serving with mini pitas, and some fresh veggies. I am also looking forward to reading more on your blog, as from what I’ve seen… Looks Great ! Fun to hear- thank you! Wow. I was panicked trying to think of how I was going to impress my friends at a special party this weekend, but you saved the day! This is EXACTLY what I was looking for! I will let you now how it all turns out– a million thanks from Thunder Bay! @Kerry, So glad you found what you were looking for! Let me know how it goes! We had a dinner party with six last night an followed all your recipes except the desserts, (the guests brought dessert). It was amazing and everyone was very pleased. Thank you for doing all the ground work and giving a menu to follow that was delicious!